Never neglect the design of your stairs because it could be a stunning architectural detail. When you pay attention to the design of your stairs, it becomes more than a set of steps that take you to up or down the house. It becomes a sculpture — an architectural focal point. 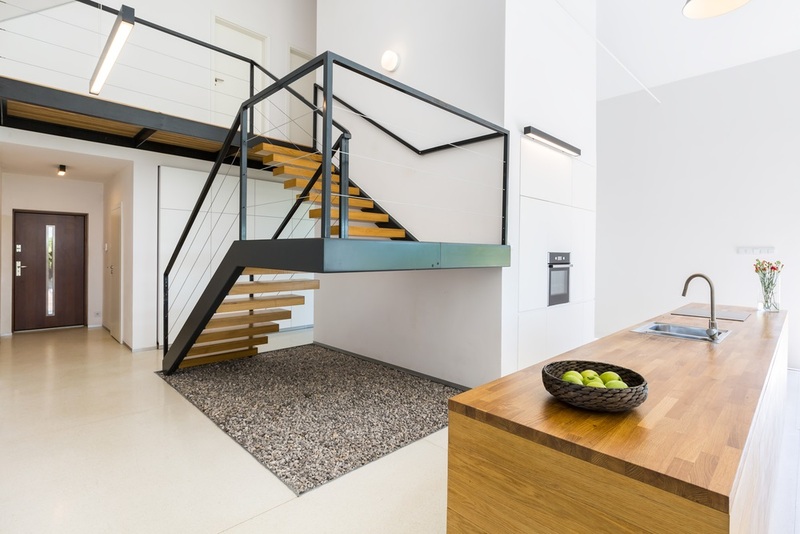 In this blog, we’ll show you several modern staircases that you can rock in your home… with proper planning of course. These staircases will add an extra special touch to modern minimalist homes. The design is simple; just a combination of conspicuous steps and clear (almost invisible) glass railings. It doesn’t have intricate details which make it easy to build. Also, these are straight stairs that are not too steep and the steps are low and wide, which is beneficial to you as you age. This U-shaped staircase (also called half-turn and switchback stairs) in this modern home offers architectural interest. It’s a massive feature made of light-coloured wood that contrasts with its black metal railings. The space underneath the stairs doesn’t look stale and empty, thanks to the pool of pebbles placed there. It is possible for you to recreate this look in both small and gigantic lofts for this staircase design is easy to fit into the plan. However, this design is a bit more difficult to build compared to the previous one. Glass stairs are popular in commercial buildings like offices, hospitals, clinics but rarely seen in homes. Put a one in your home and it serves as a stunning centrepiece. A helical glass staircase like the one below adds a sense of exclusivity and elegance to a small space. It improves the interiors as it allows light to flow and brighten the shadowy corners. A word of warning tho: only install stairs made of special architectural glass. Glass needs to be treated, tempered, and laminated to gain construction-grade strength. It also needs extra structural support to hold its own weight and the weight of people going up and down. Do you want to amaze your guests? Build spell-binding cantilevered stairs: fix the threads on a wall and don’t use any railing. It’s wonderful, but this design requires strict planning. Choose the right building material to use for this project; in the case below, the designers used raw concrete. Of course, make sure that the stair’s structure can support the load and traffic. This spiral staircase is out of the ordinary. The steps feature diamond holes fitted with acrylic and it creates an Instagrammable scene under your feet. 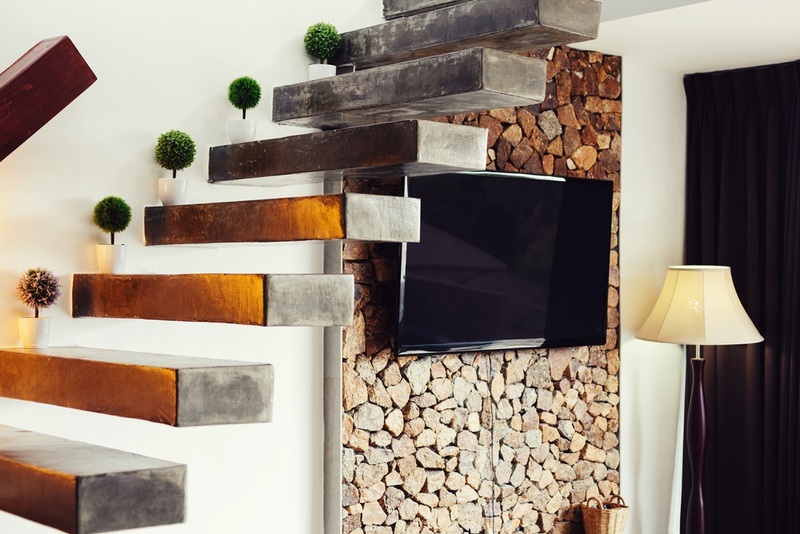 Here, you see a suspended steel staircase that’s connected to a concrete landing. Its simple and clean details fit in this minimalist home. In a neutral room full of greys and pale browns, a matte jet black spiral staircase will steal some attention. It leads your eyes up and down and adds some curve in this bachelor pad. Above all, it didn’t take up much horizontal space in this small apartment. Your staircase design is also a great opportunity to add something to your plain, neutral home design. Here, an-all white helical stairs take you up and down the loft. When stairs are designed and built well, they go beyond their primary function and turn into a work of art; an amazing structure that gives life to your home. Recreate any of this staircase design with a Gold Coast architect.